why opti-coat pro & pro plus coatings? Often called the original nano glass coating; Opti Coat Pro has been time tested for over a decade over various continents and weather conditions. Falling in love with your car or truck again is just a coating away. Taking time to regularly wash and maintain your car's appearance will be a thing of the past. Protect your second largest investment, book your appointment for Opti Coat Pro today. The Opti-Coat Pro Plus Ceramic Paint Protection package now delivers even more gloss and slickness than ever before, while still maintaining the same chemical structure that has made it renowned as the ultimate car paint protection solution. The advanced formulation not only delivers amazing gloss and protection, it also provides increased anti water spotting and hydrophobic properties to maintain the perfect finish in the long term. Opti-Coat Pro Plus is an enhanced 2 step version of Opti-Coat Pro. 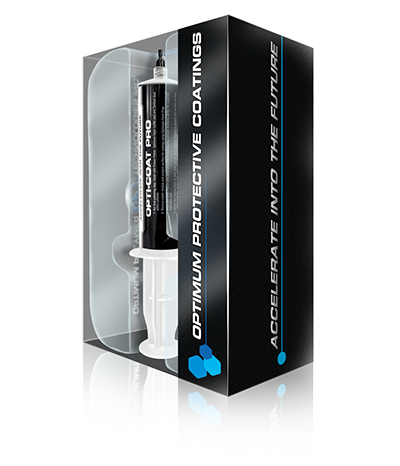 Opti-Coat Pro is a 9H ceramic coating for superior resistance to scratching and protection from chemical etching due to environmental impacts.